It’s December 27 and if you’re in the same boat as me, you had one too many of those (fill in the blank). After a weekend of indulgence, there’s nothing better than a little simplicity to balance you back out. And this magic pot of veggies will help do just that. I say magic because this thing has two whole bunches of leafy greens in it. Like magic, a towering pile of torn greens – that literally covered my counter space and had to be heaped by the armfull into the pot – shrinks itself down and practically disappears. 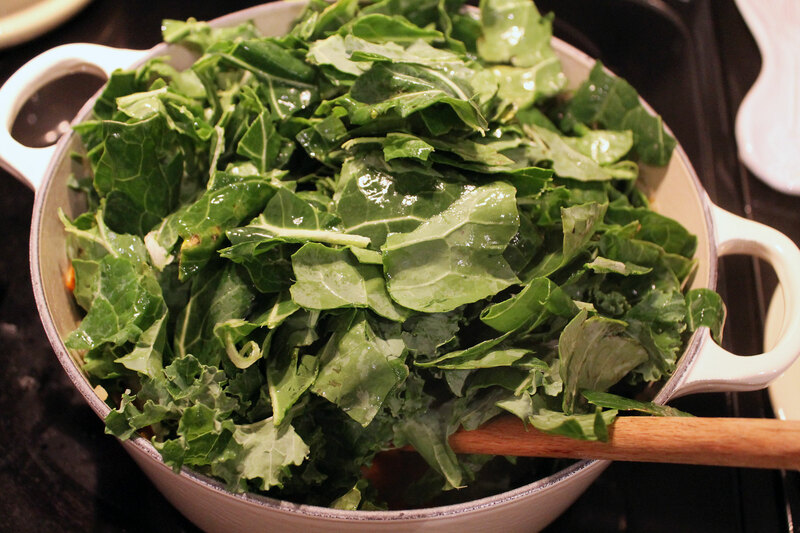 Every time I cook leafy greens and watch them reduce to a fraction of their original volume I am amazed. For such a fresh and nutrient-loaded meal, you wouldn’t know it by the time spent slaving in the kitchen. For the peas, corn and even carrots you can use frozen. That just leaves the onion, garlic and greens. Cut the onion into crescents. Mince the garlic. And after washing the greens, team up with your roommate, husband, kids and go to town tearing them into bits. Remove the hard stems and rip those leaves a new one. After a long day, I find this can actually be somewhat therapeutic. Take it out on the vegetables. 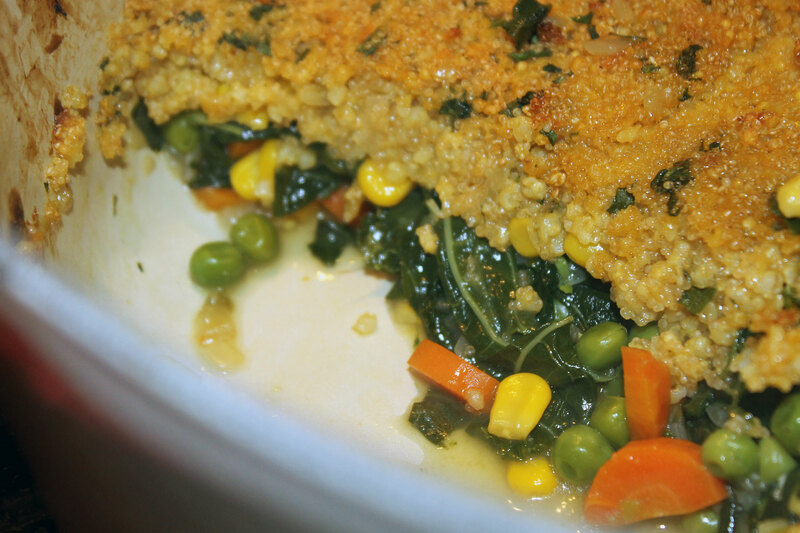 As for the crust, this recipe uses a combo of millet and amaranth. A what? I’ve actually had amaranth in my pantry for some time now but this was my first experience with the ancient grain. Amaranth was a native grain to the Aztecs and was so important to them that they used it in rituals and, in particular, what was the equivalent of their Christmas celebration. The conquistadors didn’t approve and outlawed it along with other “false idols.” It disappeared, but has been sort of rediscovered. The high-protein (5g per 1/2 cup cooked, versus 2g in wheat), gluten-free grain has resurfaced. And some even seem to think its resurgence will only continue given that it can grow just about anywhere and is easily cultivated, oh ya, and cheap. 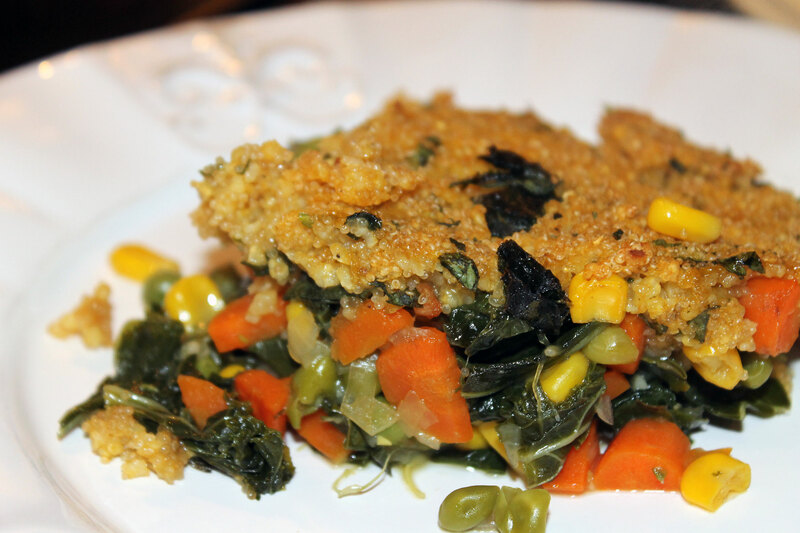 Millet is another grain alternative to wheat and is incredibly versatile. It can be prepared smooth, like a mashed potato consistency, or grainy, like rice. It’s high in magnesium, manganese and phosphorus, important minerals for heart and bone health. Together, the amaranth and millet make a bread-y, crust topping that’s sort of like cornbread. No ancient grains on hand? Shocking. Instead, you could use cornmeal or polenta to make a cornbread-style topping. Or you could make one out of rice like I did here. Warm, comfy, cozy – everything you want this time of year. Comfort. And joy. In a pot. 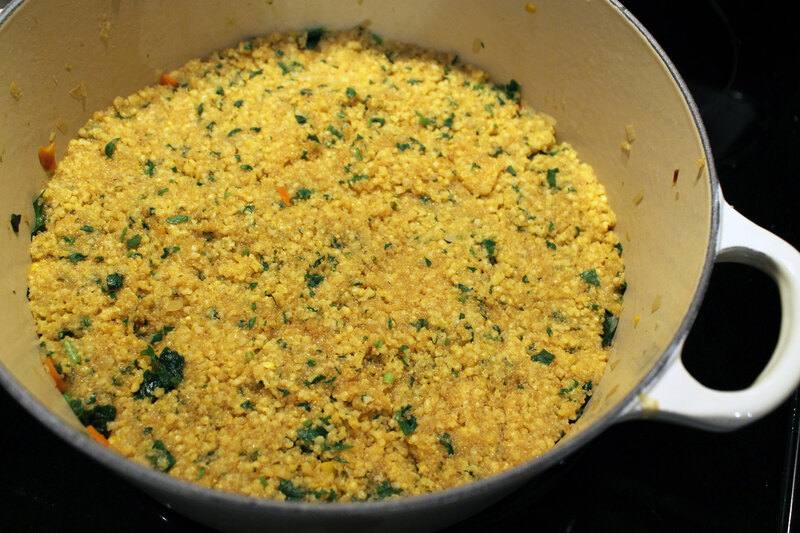 In a sauce pan combine amaranth, millet and 2 cups of vegetable broth. Bring to a boil and then simmer, about 15 minutes or until all of the liquid is absorbed. Remove from heat, fold in parsley and salt and pepper to taste. In a dutch oven, heat 1 tbsp olive oil over medium heat. Add onion, garlic and carrot and saute about 5 minutes, until tender. 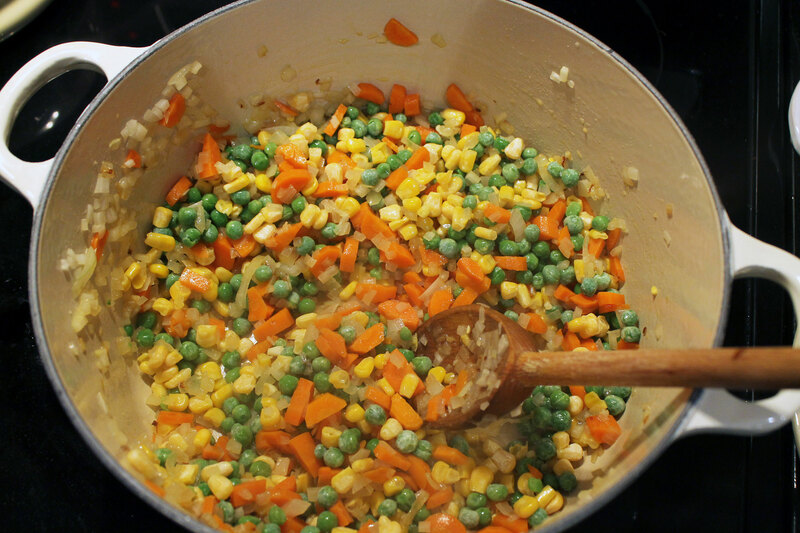 Add peas and corn and stir. Stir in mirin and add greens in batches. 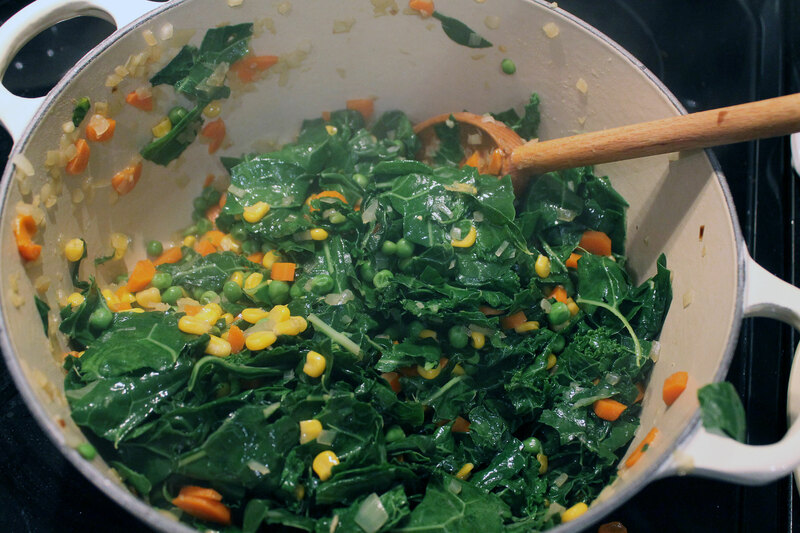 Allow greens to cook down, 5-7 minutes. Meanwhile, in a small bowl combine arrowroot, 1/2 cup water and 1/2 cup vegetable broth and stir. Add sauce to the vegetables and stir until it begins to thicken, about 2-3 minutes. Flatten out vegetable mixture and top with grains, spreading out evenly across the top to make a crust. Drizzle a little olive oil over the top. Place under broiler about 10 minutes, or until the crust browns. * Arrowroot is used to thicken the sauce. No arrowroot on hand? You can substitute with cornstarch, as long as that’s OK for you. Be sure to look for non-GMO. Love the idea of using grains for crust!